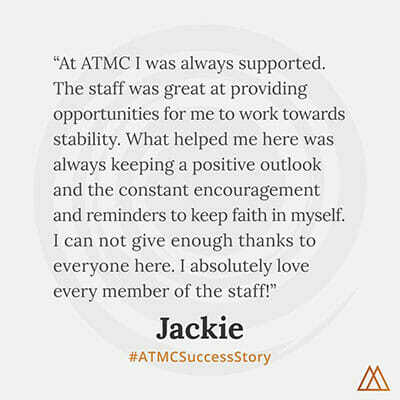 This entry was posted in Antipsychotic, Mental Health, Success Story on November 24, 2012 by ATMC Team. Thanks to Alternative to Meds Center and their staff that truly cares, I never have felt better! Nine years ago, I was given a diagnosis of Bipolar disorder. At first it was really challenging to confront the idea of having to take medications every single day. “Will I take this medication for the rest of my life?” I disliked the many side effects of these medications. They made me feel incredibly tired all of the time, and I did not feel like me! The idea of being drugged all of the time really bothered me. I felt like the medication was taking my personality away, and there was no one that I could relate to. My unhealthy fix for this problem was to discontinue the medications by myself without talking to a doctor. Without the drugs I felt more energetic and social and even euphoric at times, I was manic and loved it! If you asked anyone who suffers with bipolar disorder, they would undoubtedly tell you there is a side of manic that is dark. Breaking the law, major depression, drug or alcohol use, and broken relationships are just a few of them. The hard lesson that I learned over time was that the cause of a lot of pain for a lot of people was my mania. The other issue is that if you quit the drug over and over again it begins to lose its effectiveness. I started hearing voices that were not present in my illness during the beginning. My doctors attempted to eliminate the voices by medicating me. Sometimes the result was successful, sometimes it was not. I was still feeling devoid of my personality, tired, and drowsy. Over the duration of the past nine years I had been in psych wards way too many times, always seeming to leave with the same hopeless and lost feelings that I felt when I was checked in. At some point I started having visual hallucinations. I saw shadows of people, some of them I knew, some I didn’t. I had conversations at times with the people in my world. I felt like a complete mess a lot of the time, chain smoking, and my hygiene was let go. At this point Schizoaffective Disorder may have been the more accurate diagnosis for my condition. With all of the stimulation occurring outside and inside of me it’s nearly impossible to bond with another person. I was left to myself with the strange beliefs and ideas I have about life. 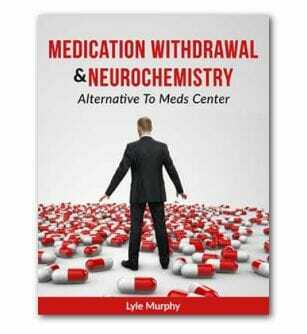 Hopeless and broken, I entered through the Alternative to Meds Center doors in search of help. At first my progress was a little slow, but I was doing what my body could handle. To remove the toxins from my body I engaged in the neurotoxin removal therapy. I was given supplements immediately which were actually really helping me. Something that is truly amazing occurred! My hallucinations all gradually went away. I was lying in bed one night and realized my mind was peaceful and quiet and had been like that for some time. It happened to me without even realizing that it did. I began to participate more in the program since my mind felt clear and I started to understand how my mind works. I started exercising every day at the gym. I found that I was enjoying the time to swim in the pool whereas during the beginning I did not even go on the optional trips to the gym. I began to extend my time at the medication detoxification clinic, as it started to feel exciting when the toxins were being released from my body. On top of all of the things I gained from being at Alternative to Meds Center, I also lost thirty pounds during my stay of three months. The food tastes good and it’s healthy.